Congratulations on your new portable wireless Bluetooth speaker! Please read these instructions carefully before use. Please charge the speaker before use. Charging takes approximately 3 hours and will run for about 4 hours depending on the volume level. You can use the speaker while it is plugged in and charging. 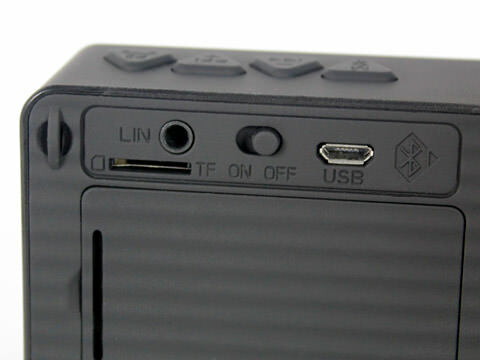 Connect the included 3.5mm stereo audio cable to the “LIN” input on the back of the speaker. Connect the other end to the headphone jack of your smartphone or tablet. Insert a MicroSD card into the slot labeled “TF” on the back of the unit. The gold connectors should face up, or the label side of the MicroSD card faces down. Music will begin playing automatically when the speaker is turned on. A single short press of the Telephone button will answer an incoming call when paired with a smartphone. A longer, 2-second press will reject the incoming call. You can redial the last number by pressing the telephone button 3 times quickly. Supports Bluetooth v3.0 and higher. Includes A2DP, AVRCP, HFP.